This is not being investigated because there are no pictures on the entire website. If there were results, they would undoubtedly post them. That pretty much says it all. » pretty much says it all. It’s adistem all over again. Moreso, I’d like to affirm my personal contempt towards these hairloss treatment sites that use stock photos of male models with full-heads-of-hair to highlight their treatment. Why is this not being investigated?? Is there no one near Edinburgh? » Why is this not being investigated?? Is there no one near Edinburgh? Here is the response from the company. Pretty thorough response. I have requested pictures and will post once I receive them. My sincere apologies for the late reply to your email. We have been flooded with inquires in regards to this type of AAA (Autologous Adipose Adult) stem cell therapy for hair regeneration, and this has caused some delay in processing client inquiries. The current situation is that most countries around the world still haven’t passed legislation approving the use of AAA stem cells, even though we stipulate in our Ethical Charter, that we do not under any circumstances use embryonic stem cells. We only use stem cells from you, for you. It seems our company is slightly ahead of the curve in developing stem cell therapies that completely bypass the previous moral and ethical issues. As a result, we have had to evolve our service locations in response to the current situation. 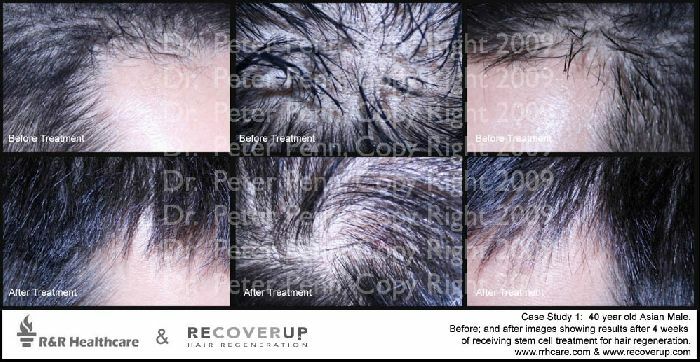 Currently, we are offering the Recoverup Stem Cell Hair Regeneration service in Taipei , Taiwan and Penang , Malaysia . The treatment cost is approximately 8,000-13,000 USD per procedure, with cost depending on the each specific customers required treatment area. The cost is not per follicle but per procedure. However, for extended areas the procedure may take place over more than one day, and in that case the overall fee may be higher. This procedure cost does not include travel, travel insurance or accommodation. The first treatment is a liposuction and requires at least 200 ml of fat to be extracted, usually from the waist area. The larger the required area of treatment on the scalp, the more fat needs to be extracted via liposuction. Also the success rate of the extracted fat to stem cells conversion, depends on the patients overall level of existing health. Therefore, the main considerations are level of health and area to be treated. Then later in the same day, the extracted stem cells would be cultured and inserted back into the patients scalp. This ‘same day service’ was developed specifically to cater to our overseas customers, who would otherwise need to wait several weeks whilst the cells were cultivated. If there is very large area that needs to be done, then the surgeon may consider more than one session for implantation of stem cells. If there are no results after 30 days, we will refund your treatment fee. To this date, all of our clients have had successful results. Of course, there is some variation in the amount of hair grown, which depends on the time since the hair loss, the age and condition of the patient, and the amount of fat obtained. In some cases, it may take more than one treatment to get the results required. In terms of providing pictures, we have found many ‘hair restoration’ websites to have such pictures enhanced with photo editing software, etc and as such we didn’t consider to put up such pictures. If you feel you would still like to see some suchlike, then I could arrange to send some to you via email. If you are interested in continuing further, please provide a ‘statement of medical health’ from your Doctor detailing any existing conditions, allergies, medications, in addition to your BMI (body mass index). Finally, please provide 4 photographs of the treatment area on your scalp you would like the surgeon to consider (please provide front, top, left and right side views). Please note your personal information would not under any circumstances be shared with any other person apart from our R&R Healthcare Customer Service Team and your Responsible Surgeon - your anonymity is assured. Once again, I apologise for any frustration our slow response may have caused you. We hope to hear from you soon. Thank you for your interest in Recoverup Stem Cell Hair Regeneration. What are the chances this is real? With all the doctors working on stem cell research, this is very unlikely. As much as we all want to believe, better we forget about these guys. The only way I would beleive is to see someone who has had it done. Even pictures from these people would be far fetched. » better we forget about these guys. » pictures from these people would be far fetched. I sincerely apologise for the delay in replyng to you but our office was overwhelmed by the response for our service. If you would like to recive futher information,please send your email addess to bobby@rrhcare.com and i will see to it that your enquiry is processed promptly. manager R&R Healthcare Customer Service Team. Obviously, there may be something to this (I’ve heard of similar treatments being offered in the Far East, and they also claim to offer a full refund if hair doesn’t grow) but I suspect it’s not legit. Then there are inconsistencies in their account of how it works. If true, I could live with having all my follicles again then having to top-up every 2 or 3 years. But this just stinks to me. Until they put up their own photos, it might be interesting to see if anyone on the forums (maybe the Far East forums, if anyone can read those) has had this done and what they think of it. » What are the chances this is real? i think it’s probably real. The technology is not that complicated and the fact it’s not “here” in Europe/US is only due to the leglisation and trials duration in those countries. As for the result, i hope Tricky95 will have some pics so we can check them out. If they had pics I would give it a second look. If they had pics, a regular poster here contacted & dealt with the company, they said it seemed legit, and they regrew something (with pics), then I would give it a third look. So far I’m only giving it the first look. Is there any reason why their treatment shouldn’t work effectively? Anyone with a scientific background have any opinions on what they are talking about? » Is there any reason why their treatment shouldn’t work effectively? We all wish. Now if they post pictures, will we beleive? I don’t know. If I were promoting this product and it really worked, I would be gathering all the cash I could possibly muster, to promote this, the return would billions upon billions. That should expain everything. do you have to travel to the far east for the treatment or are they carrying it out in scotland? the photos, the photos, got them? It seems that they are not even able to do the crudest form of photographic manipulation. are they operating in the UK?? isn’t there any way to have the authorities to chase them down? I am amazed at this situation. We are not talking about thirld world countries. We have charlatans in USA, UK, Holland, claiming all kind of miracles without decent proof, and they are SELLING these procedures, and the authorities do nothing. Maybe they are too busy being bribed by the big pharma companies. This is a circus, a joke. Our health and legal system is a disaster. I’m the marketing manager at Recoverup, and I was sent here by a customer who emailed us and suggested I join this forum to get the word out. It seems there’s some concern about our company’s ability to communicate/ market ourselves properly. And to be honest, I think we’ve made some mistakes in our launch. A key complaint I’ve seen on this forum about our company is that we showed pictures that were damp in the before and dry in the after. 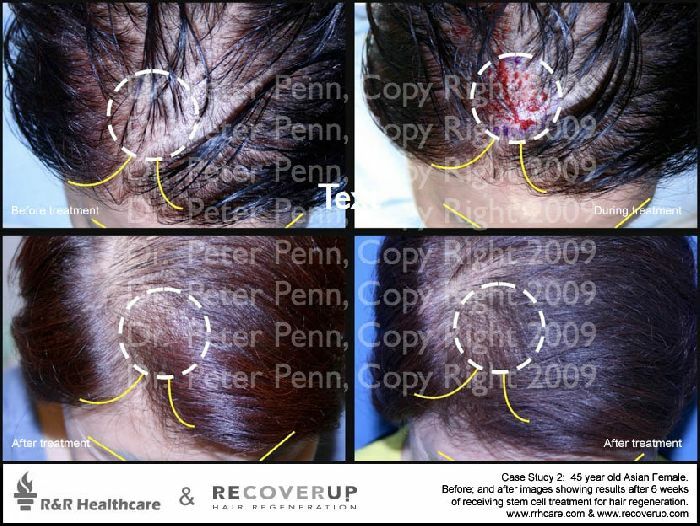 This was because the patient’s scalps were dampened before stem cell injection. The Dr. chose those pictures because he felt it showed the follicle density clearly. However, SpanishDude pointed out to us that this was misleading, and we stopped using those pictures immediately, and found before pictures of the relevant clients that were dry. These are the same people, just a different selection of pictures. I enclose them here. However, I can say the treatment really works. It’s ethical, safe and effective. (We only use stem cells taken from your own body - no embryo’s or animal stem cells used). It’s not a “miracle grow” - but it does help significantly with thinning or patchy hair. Dr. Pan, whom I’m posting this on behalf of, has empirical data showing at least 40% improvement in treated areas. That said, if you are completely bald in a particular area, a hair transplant may still be your best option. » are they operating in the UK?? » isn’t there any way to have the authorities to chase them down? » This is a circus, a joke. Our health and legal system is a disaster. Yes, it is real, as you say the science behind it is not that complicated. The treatment uses Autologous Adipose Adult (A.A.A.) stem cells. These are stem cells taken from your own body (fat stores), separated, activated and inserted under the scalp. The treatment is relatively inexpensive (compared to a hair transplant) and relatively painless. The only reason we can’t open clinics in US and Europe is the legislation there, which is slightly behind the times. Initially anti-stem cell legislation was placed to stop researchers using embryonic stem cells, which I actually think was a good idea. Embryonic stem cells means the death of an embryo, a life in other words. Stopping this kind of research made sense morally and ethically. What’s happened in the past 2-3 years is the discovery of being able to use autologous stem cells (ie. stem cells from your own body) in the treatment of your own body. It’s not just hair loss treatments that are benefiting, these autologous stem cells are being used in heart repair, brain repair, diabetes, etc. Not only are autologous stem cells more ethical, they actually out-perform embryonic-derived stem cells hands down - as there aren’t any ‘transplant’ or ‘rejection’ issues. Unfortunately, the laws in the UK and US are probably not going to change soon. The science is moving faster than the laws are. » » What are the chances this is real? » duration in those countries.